Love, Mrs. Mommy: BubbleBum Prize Package + $75 Amazon Gift Card Giveaway! 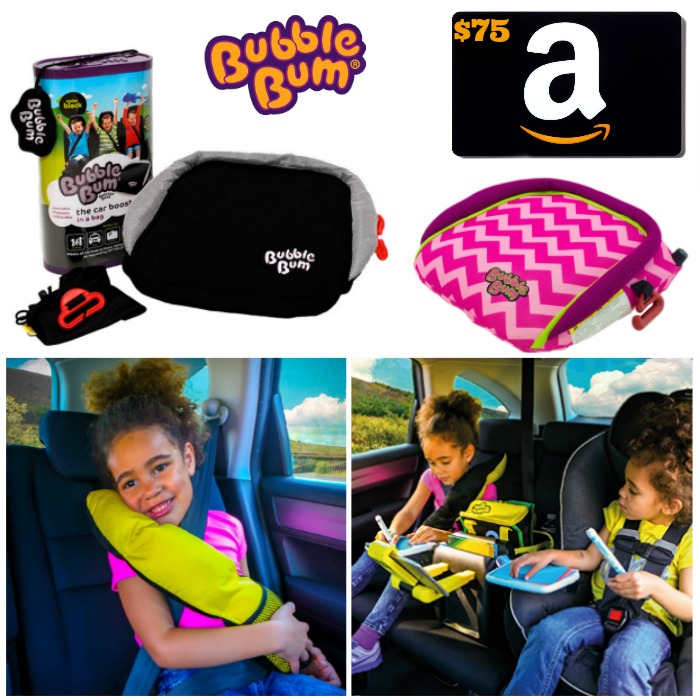 BubbleBum Prize Package + $75 Amazon Gift Card Giveaway! 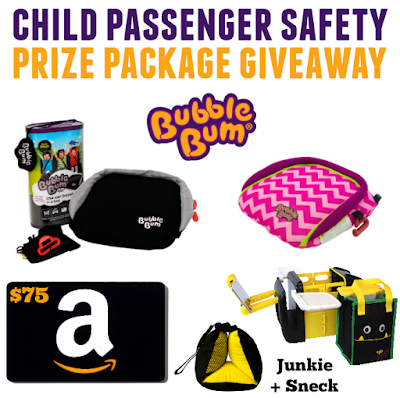 Nothing is more important than making sure your kids are happy and safe, so we've teamed up with BubbleBum to share some tips for child passenger safety and to give away a fantastic prize package to one lucky family! Kids love staying both safe and comfortable with BubbleBum’s kid-approved, super cool inflatable booster seat. Buckle up your older kids (age 4-11) in a car booster seat providing safety and comfort that is the top choice for all parents. BubbleBum gives kiddos the perfect "boost" to prevent the risk of slouching (which happens with flat car booster seats) and seat belt abdominal injury in the event of a crash. The cool factor makes kids more likely to want to use a booster seat. BubbleBum - It's a best seller and parents’ favorite, winner of more than 20 design and innovation awards including Mumsnet, Mother & Baby and Practical Parenting. 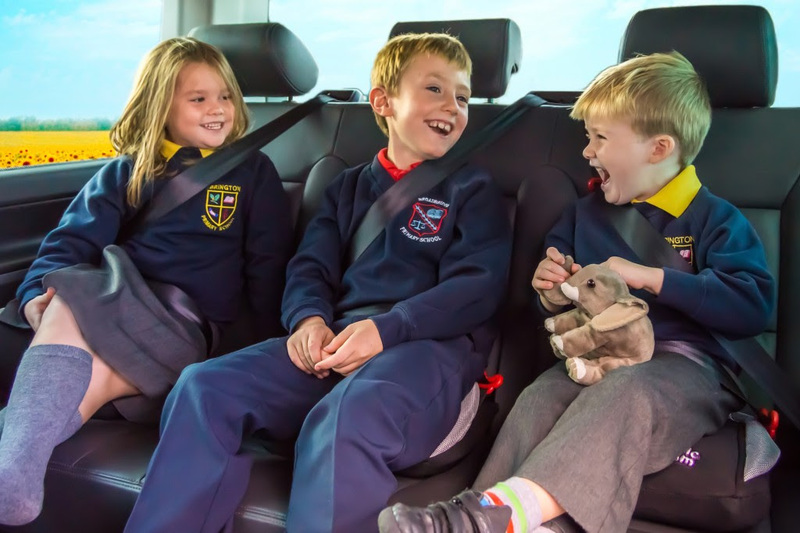 The portable, lightweight, inflatable car booster seat for children aged between 4-11 easily deflates and packs away, making it perfect for vacations, rental cars, taxis, coach journeys, school trips or carpooling. Sneck Travel Pillow - This comfy travel pillow’s micro-bead filled pillow pods and cozy material allow your child to sleep in total comfort, while providing head and neck support. Perfect for car journeys, bus trips or fly-in’s, the Sneck easily attaches to the headrest with a Velcro strap so it stays in place and the kids can snooze comfortably. This cool pillow system also comes with a stash pocket so your child can store their mp3 player or mobile device while not in use. Junkie Organizer - The Junkie transforms your backseat, organize your junk and keeps your kids entertained. With a “tech mount” for kids to share one device, both kids can access, interact and view together. Two compact, retractable activity trays for snacking and play. Junkie also features two convenient cup holders. Expanding compartment fits the removable, reusable, refillable totebag with insulated pocket, to transport all your junk from home to car. I learned that this booster seat has been crash tested and that it is portable. Safety comes first....from the design of the product to the sale to the customer. I wish I had thought of this!